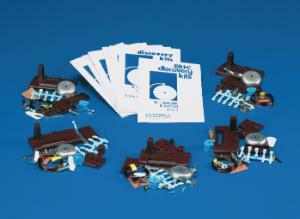 Students use these totally self-contained kits to assemble an electromagnet, sounder, buzzer, and a bell. The set Includes 5 complete kits with all the materials required (except batteries), plus student manuals and a teacher's guide. For junior high school and up.